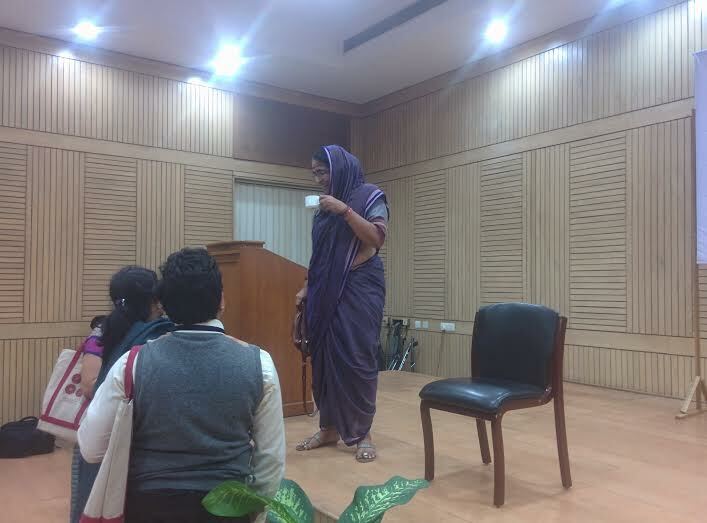 The 5th International Conference of the Comparative Education Society of India (CESI) on the theme “Education, Politics & Social Change” was held in Delhi University from 16-18 November, 2014. Rich and complicated conversations were followed by evenings of music and drama. One such event was the solo play, “Haan, Main Savitribai Phule,” written, directed, and performed by Marathi experimental theatre artist, Sushama Deshpande. Deshpande trained under the Brazilian theatre practitioner, Augusto Boal, who developed the Theatre of the Oppressed. The play, originally written in Marathi as “Vhay, Mee Savitri Bai,” narrates the everyday life of Savitribai Phule, the wife of the 19th century social reformer, Jyotirao Phule. In the play, Savitribai tells us the story of her life – her birth, marriage, and life with Jyotirao Phule, their work for the upliftment of Dalits and marginalized women, the death of Jyotirao, and her own death from plague in 1897. Standing on stage, Sushama Deshpande revealed to us that she was tense every time she performed the play in Hindi and worried that she might forget the lines. Pointing to a black bag, she told us: “My script is that black bag. If I forget I will stop and take a look at my script. I will also stop to drink water. After all, I am not taking an exam. I am here to bring Savitribai to life.” Talk of alienation effect a la Brecht! In one of the most memorable episodes in this play, Jyotirao Phule started reading to his unschooled wife. Savitribai was besotted with her scholarly husband but his social commitments kept him out of home for the most part of the day. When he did return home, he would be engrossed in his books. As a way to spend time with her husband and to get him to talk to her, Savitribai started asking him what he was reading. Jyotirao, thus, started reading to her and later taught her to read and write. She says, “At first I used to read and write because it would get me his love and attention but later because of a love for learning.” When he could not find a teacher for the school for Dalit girls that he started in 1848, he asked his wife to teach. In the mornings Savitribai would teach in the school and in the afternoons she would be taught how to teach. She started teaching at a time when women would hardly step out of their homes. Moreover, as a low-caste woman, who had dared to take up teaching, Savitribai had to face a lot of harassment on her way to school. During the play, some of the people in the audience started to talk among themselves. Sushama Deshpande stopped her narration and asked the audience if everything was alright for she had heard a murmur. She said that since she was alone on stage she was acutely aware of audience behavior. Sushama Deshpande has been performing this play for over 25 years. Hence, there have been occasions when someone who had first seen the play in her adolescence was now the mother of an adolescent herself. Once in a village a lady came and told her that she had decided to educate her daughter despite all obstacles after watching the play. Another person in the audience asked her about the Brahmanical response to a play based on a couple who flouted caste conventions. She replied that once a man, who served as a doctor in a low-caste community, had requested her to come and perform the play in his locality. She asked him why he wanted her to come. Since he was having problems with the patients in his area, he felt if, as a Brahmin, he brought this play to them they would think that he stood by the values propagated by Jyotirao and Savitribai Phule. At the same time he believed that Sushma ji, being a Brahmin herself, could not say no to his request. She refused him. Listening to Sushma Deshpande perform and speak, one could not remain untouched by her passionate commitment to the life and message of Jyotirao and Savitribai Phule. Mary Ann Chacko is a doctoral candidate in the Department of Curriculum and Teaching at Teachers College, Columbia University. Her dissertation examines the Student Police Cadet program implemented in government schools across Kerala, India with a focus on adolescent citizenship and school-community relations. She is an Editor of Cafe Dissensus. Read more of her work on her blog, Chintavishta. Read the latest issues of Cafe Dissensus Magazine, “Teach for India: A ‘Movement’ to Uproot Inequality through Education” (Edited by Mary Ann Chacko & Yohann Kunders). Thwak! Ouch! %@%! Ugh! That felt good, thanks!